This customer based in West Sussex came to us to create a bespoke alcove unit to incorporate their love of their vinyl records into their home. 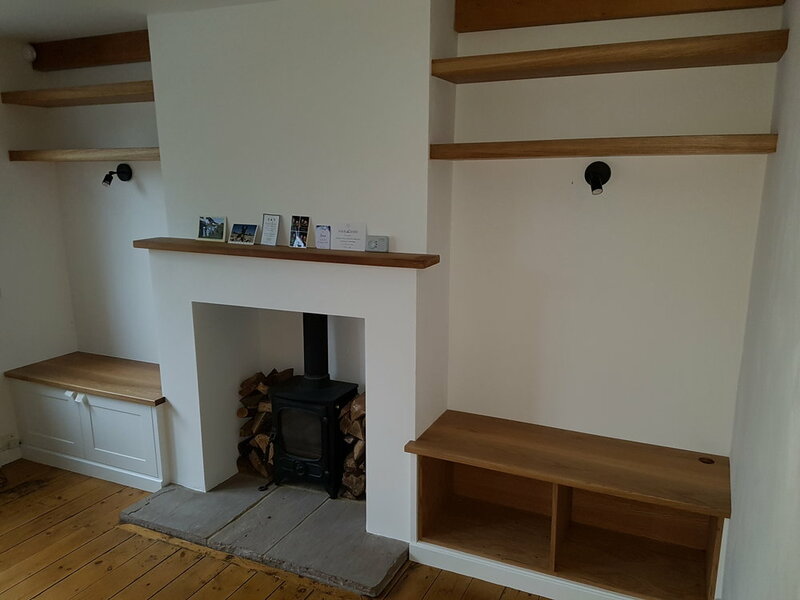 The customers let us know that this was their dream home and planned on staying a very long time, so they wanted the build quality of handmade furniture. seats, as well as storage. The unit was sprayed in Farrow and Ball all white waterbourne lacquer. The record unit and shelves are primarily made from oak veneered MDF, to help stay within their budget but with solid Oak edgings and cappings for durability. The solid Oak unit tops are finished in Osmo wax oil, which is extremely hard wearing and easily repairable by the customer if any mishaps were to occur during a party, which as we all know, can happen! We understand that every project is different. We are flexible with our approach and happy to accommadate any specific requirements. Please call 01403-865-113 if you would like to discuss your project in more detail. Matthew Roberts Carpentry offers the finest quality work, from fitted wardrobes to bespoke furniture.